Sometimes when you cook all the time, our knowledge gets the best of us. We sometimes assume people know how to cook the basic things. Things like Quinoa, Brown Rice, different various food items that everyday kitchen staples that we know how to cook others may not. I made a short how-to video with the help of A258Production owned by Carrie Montoney, we created a very impromptu How to Video. This is something I plan to expand with, so to all you loyal readers, keep on watching! Enjoy! Measure 1 cup of quinoa and put into the mesh strainer. Rinse the quinoa with cold water for about a minute or two to rinse off the bitter coating on the seeds. Add 2 cups of cold water into a saucepan with a tight fit lid, heat water over high heat till boiling. Add the rinsed quinoa and let the water resume boiling, then reduce to low heat. Cover with lid and cook for 20 minutes. Do not stir, open and remove the lid to peek. Leave the pan alone. The water will evaporate. The quinoa seeds will burst open when cooked completely. After 20 minutes, turn off heat and let quinoa rest for ten minutes. 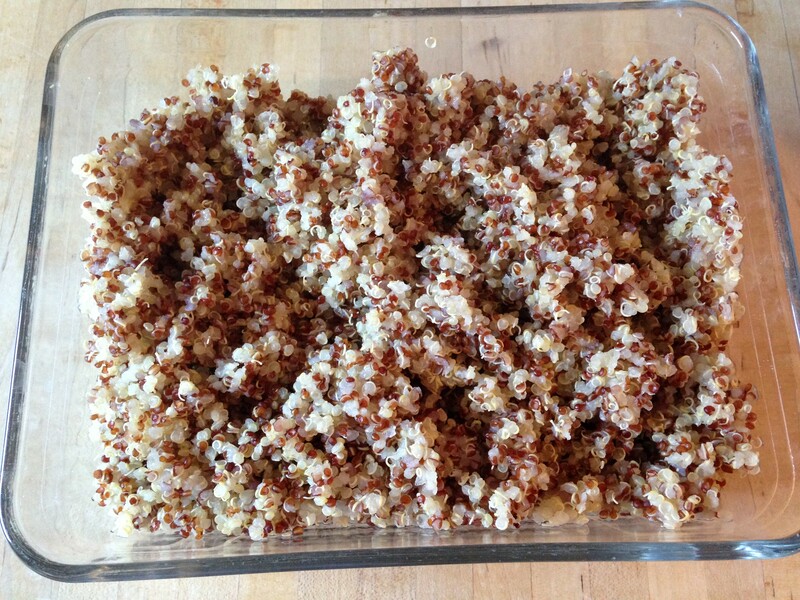 Transfer quinoa to a dish using a fork to remove from pan to prevent clumping. Do not use a spatula or spoon as it will mush the quinoa together. Roasted or baked pie pumpkins are so easy to do. Some cut the pie pumpkins in half and scoop out the pulp and seeds, brush with olive oil, and season with salt and pepper. Roast the pie pumpkin in a 400 degree oven until soft is one way. I am lazy; I just want the cooked pumpkin to use in many of my recipes. I prefer this way because it is easy for me to scoop out the pulp and seeds after cooking the pumpkin in a 350 degree oven for approximately one hour. Enjoy! Well, this is the first recipe that starts off my Eggs Benedict kick. I realize I posted earlier the Portobello Eggs Benedict as one of the first recipes for the “Eggs Benedict Kick” but technically this is the first Eggs Benedict recipe that starts my quest for the perfect recipe. But who is counting? Not ME! I had some red fingerling potatoes on hand and decided to create a mock Hollandaise sauce with sour cream, dill, fresh lime juice and cracker pepper to give the recipe some texture. I really liked how the sauce turned out and the different flavors from the simple ingredients really complimented one another. Place the sour cream in a bowl and squeeze the juice of one lime into the bowl. Add the dill and cracked pepper. Mix ingredients well, and set aside. In a stock pot lined with a steamer, fill with approximately 3” of water. Slice the scrubbed potatoes 1/8” thick and lay in the steamer the sliced potatoes. Turn on burner to high heat to heat up the water so that the potatoes can steam cook. Cover and cook until the potatoes are tender about 10 minutes; cooking time can be less depends on your stove. Season the potatoes lightly with salt. In a 10” pan, fill up with water till about 1-1/2 inches from the top. Bring to a hard boil and then reduce the heat until the water is just simmering. In the pan with simmering water, add one teaspoon of vinegar. The vinegar will help keep each egg together (congeal) and not spread in the water. Cook the eggs in simmering water for approximately 4 to 5 minutes and remove with a slotted spoon onto a paper towel to collect any excess water from the egg. Remember, you can cook the eggs longer to your preference but you will want to have some yolk flavor the dish. Slice the tomatoes. Cut the avocado in half and remove the pit. Remove the avocado meat from the skin and slice. On a plate, place the steamed potatoes in a circular pattern. Lay four slices of avocado on top of potatoes, then four slices of tomato on top of the avocado. 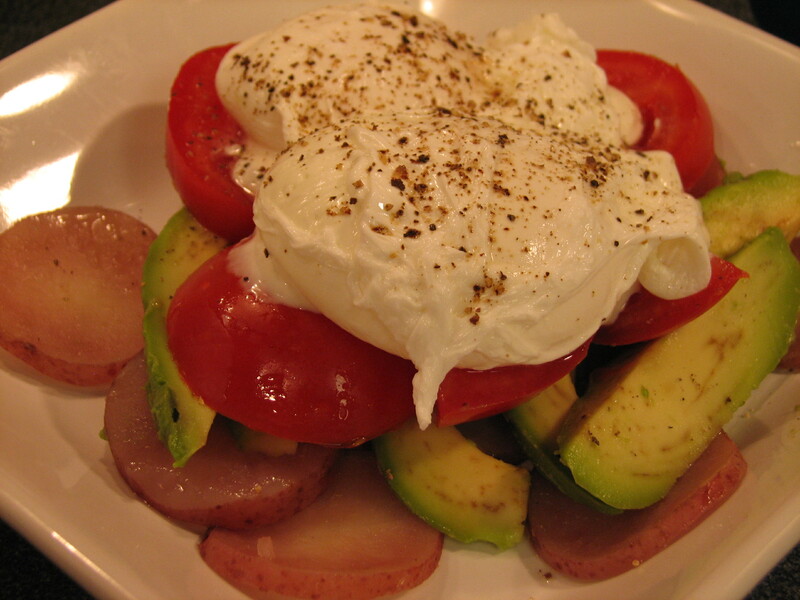 Spoon the sour cream mixture on top of the tomato slices and place two poached eggs on top of the sour cream. Season the poached eggs with salt and cracked pepper. Enjoy!